It’s that time of year when we decide what to do and where to go on holiday. Do we go away, do we stay local? One place that sprang to mind was a camping holiday in France. 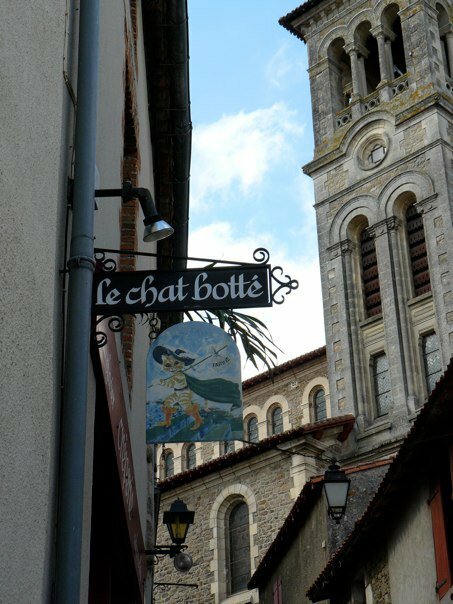 Having visited there a twice in the past few years to see family, we have fallen in love with the Brittany countryside and especially the food from the region. Since we’d been talking of France so much, we decided to make a special meal of galette complète to remind us of our visits to the galette place in Nantes (I can’t recall the name of the amazing restaurant) and also to the Le Chat Botté in Clisson. Make a well and add the egg and a bit of milk to form a smooth paste. Then add the rest of the milk, mixing thoroughly. The batter should be smooth and have a ribbon-like consistency. Leave to sit at least 30 minutes. In the meantime, heat a large non-stick skillet over medium-high heat. Ladle a spoonful of batter into the centre of the pan and tilt it so that the mixture spreads easily over the hot surface. Make sure that you have a very thin layer of batter. Cook the galette for about 2 minutes or until the edges curl up and the bottom begins to brown. Flip and cook the other side. Continue this process until you’ve used up all your batter. Makes approx 4 galette/crepes. To fill, melt a pat of butter in the skillet and heat the galette on one side for about 15 seconds. 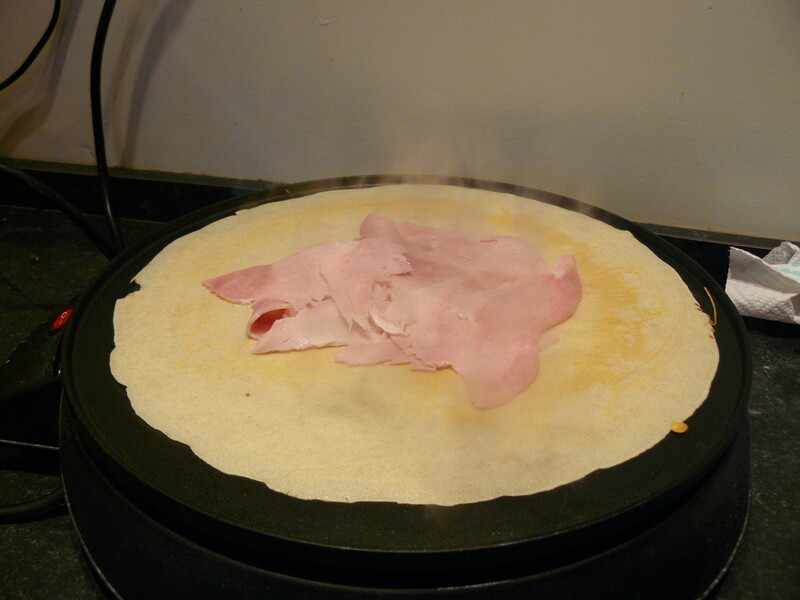 Flip the galette over and scatter almost all of the cheese around the crepe. Let the cheese melt then add the ham, sprinkling on the rest of the cheese. Crack the egg over the ham. 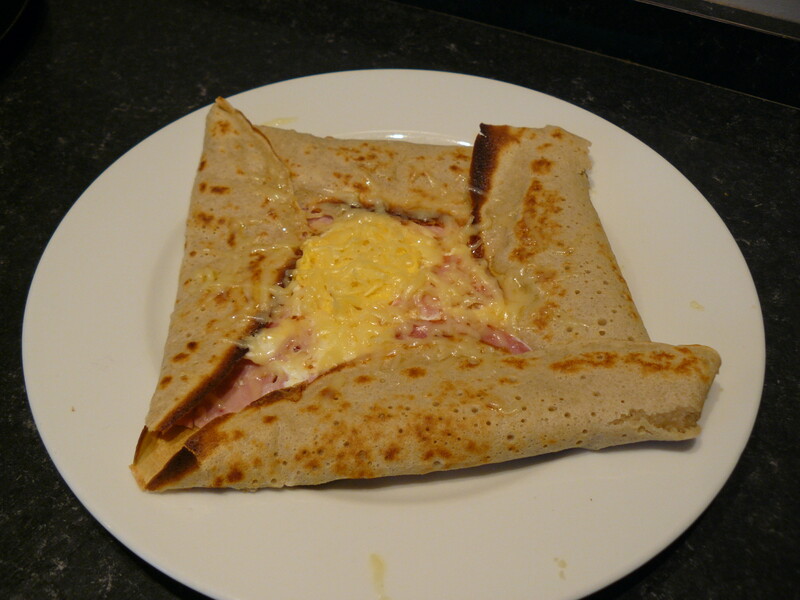 Gently fold each side of the galette so that the filling is sealed. If the yolk doesn’t seem cooked enough, break so that it runs slightly, and cover with a lid until the egg is cooked. 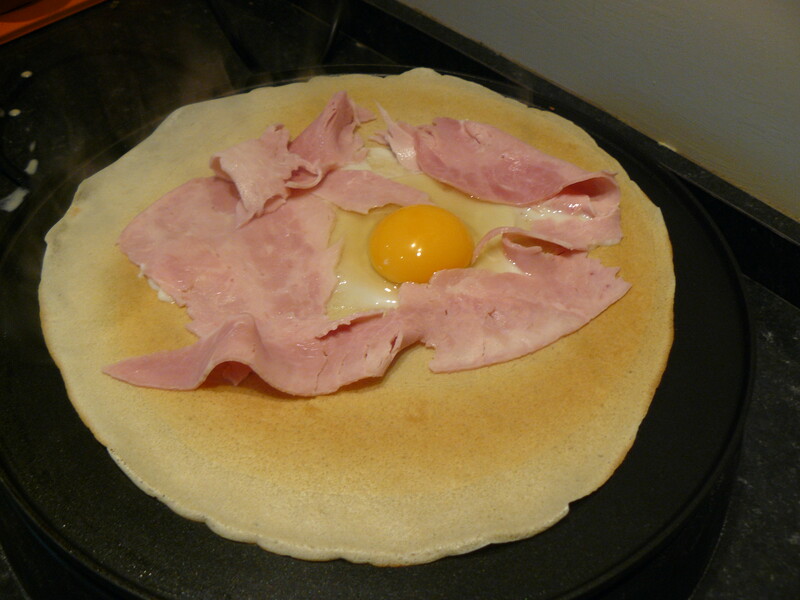 Alternatively, to cheat… scatter the cheese over the galette, add the ham and then add a sunny-side up fried egg on top, fold the sides of the galette in… et voila! You don’t have to worry if your egg cooked or not. Serve with ice cold brut cidre, from Brittany of course. We’re going to keep researching our holiday, in fact a few places have caught our eye like Thomson AlFresco La Grande Metarie campsite in Carnac, but until we make it back to Brittany, we’ll have to keep the memories alive with the taste of our home made galettes. Finding cards for Valentine’s Day is always a tough one, especially with my busy schedule it’s hard to get out to actually purchase cards. I don’t usually go for the lovey-dovey sappy sentiment so I like having the option to personalise cards and choose what I want it to say. 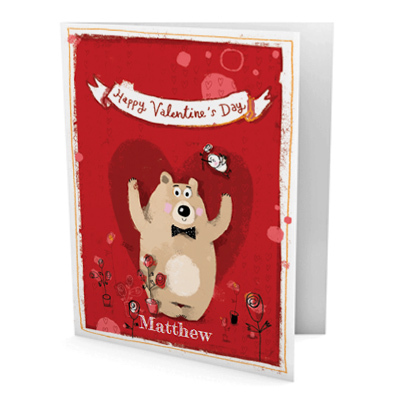 ChuckleMonster is a great option for those who want to personalise cards with their loved one’s name or by uploading an image to create an extra special Valentine’s photo card. I was able to choose cards for each my husband and my son to suit both of their personalities and order them in less than 5 minutes, allowing me to get on with my busy day. What’s even better, all Valentine’s cards get free shipping! If you are in need of cards for any occasion, Chuckle Monster is a way to go. Check out ChuckleMonster’s Valentine’s competition on Facebook where one lucky winner will receive a Hotel Chocolat hamper with a bottle of Prosecco and a personalized Valentine’s Day card, or follow them on Twitter: @Chuckle_Monster.